Maintaining your organic lawn is for the most part a year-round activity, its schedule dictated by seasonal conditions and local climates. Whether you are weeding, fertilizing or aerating, there’s plenty of work to do in the yard all spring, summer, fall — and in some areas of the country — winter. Here’s our year-round lawn maintenance schedule. With the right lawn and landscape supplies growing organically is easy! 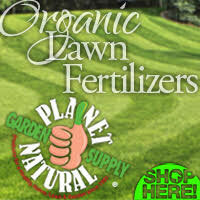 Planet Natural has everything you need to get started — soils, weed control and fertilizers. Plus organic pest control that will guarantee you’ve created the greenest, healthiest turf possible. Let’s grow together! 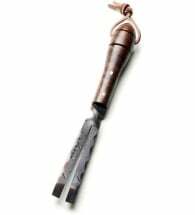 Particular weeds are covered under Lawn Problems; you’ll find the greatest detail about weeding tools and techniques under Weeds in Long-Term Lawn Rehab. This section deals primarily with why seasons have anything to do with weeding at all, and then with what to do when. It may not be obvious that weeding has anything to do with seasons, save that it’s hard to dig them out when the soil’s frozen. But in fact, the way that plants (including weeds) grow means that they are particularly vulnerable in spring and fall. Most really troublesome weeds have developed extraordinarily efficient reproductive systems. Either they produce vast quantities of quick-to-germinate seeds (think: dandelions) or they produce vast root-systems whose rhizomes and root-buds give rise to new plants without seeds. The key to least-toxic weed control (PDF), then, is to prevent them from either producing seeds or from feeding their roots and thus extending their root systems — or both. From dandelions to kudzu, it’s those extensive root-systems that make perennial weeds difficult to yank and eradicate. Throughout the summer and fall, the foliage they sprouted in spring is feeding their roots, which store the energy produced through photosynthesis. When the foliage dies back in fall, the plant becomes dormant, and when spring comes, it uses the energy stored in its roots (together with the nutrients in the air and soil) to produce new foliage. In spring, many weeds in your lawn put on a growth spurt, which means that much of their energy is invested in their leaves. If you deprive perennials of their foliage at this stage, you seriously deplete their energy resources, damaging them more than would a similar injury later in the season. The investment metaphor makes it easier to understand why some sources recommend going after bind-weed, for instance, only when shoots are six to twelve inches long, and only when it is actively growing. Tackling it when it is dormant is like cutting off a fingernail; it doesn’t hurt the plant (or at least not much). Cutting it back in late spring, however, means you’re hitting it when and where it hurts. At that point, the roots are somewhat depleted by the effort that went into producing foliage, but the foliage has not yet started replenishing the roots. Annuals are simply easier to pull in the spring, before they’ve had a chance to develop an extensive root system, and before soil has dried. In fall, many seeds are already either germinating or in place to do so. Killing seeds at this point means you won’t have to dig up the plants they’d produce in the spring. Furthermore, if you can make a dent in the perennial weed’s root system in the fall, you’re already impeding its ability to produce shoots in the spring, and it won’t have a chance to repair itself before cold weather ends the growing season. 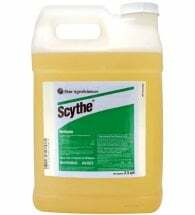 If the problem is largely weeds that propagate by seed, such as dandelions or various grasses, spread corn gluten meal. Corn gluten is the only natural pre-emergent herbicide, meaning that it kills seeds, preventing plants from emerging from the soil. Obviously, this product can’t be combined with a fall re-seeding program! Since corn gluten contains 9% nitrogen, it covers your fall fertilizer needs as well. Dig out as many perennial weed roots as you can, being careful to remove all root fragments, since bits as small as a centimeter in length can start entire plants in a number of species. 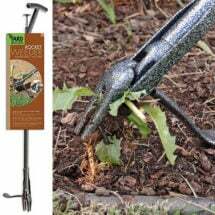 Place weed cloth or black plastic over dense patches (under shrubs or trees, or even in the middle of the lawn) to prevent the early emergence of perennial weeds. This plastic can in turn be covered with wood chips or bark mulch so it doesn’t look so unsightly. The plastic or weed-cloth treatment only makes sense on places where you’ve realized that you’re not going to be able to grow grass for a few years, until the weeds are dead. Be sure that the weed barrier extends out beyond the edges of the patch, or the weeds will come up all around the barrier, which is most frustrating. Everything you did in autumn can also be done in early spring, with the addition of hand-weeding. Many weeds are actually most vulnerable when their shoots are several inches long, so it’s not necessary to nip them in the bud. Waiting too long, however, gives them a chance to develop a major root system, which makes pulling them more difficult. For perennial plants, waiting until summer also gives the foliage a chance to begin storing energy in the roots. For dandelions and their ilk, this just means a bigger root to pull, but for plants with rhizomes or stolons, it means a bigger root system, and more shoots to dig out. Many homeowners believe fertilizing to be the key to a healthy lawn, but most experts would disagree, picking aeration instead. This is a testimony, first, to the importance of soil, and second, to the fact that lawns have a much harder time of it than gardens, soil-wise, because people walk on them all the time. Since compaction is almost a given for lawns (it seems to come with the territory), aeration should be part of the homeowner’s seasonal routine. Aerating is a bit like taking core samples from your lawn, over and over, and dropping the cores right back on the grass. The numerous holes increase air circulation to the roots and improve the soil’s ability to retain water. It also helps control thatch, simply by breaking it up on a regular basis. Learn more about Home Lawn Aeration here. Since it does cut grass roots, aeration should only be done in spring or fall, when the lawn can repair itself easily and when it isn’t already stressed by heat. Aerate in summer, and you risk killing some of your grass. The Yard Butler® Manual Lawn Core Aerator reduces compaction and thatch to let air, water and fertilizer down to the root zone. Healthy roots are essential for healthy turf. 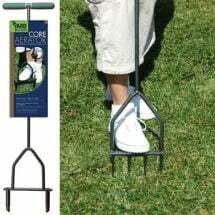 Some healthy lawns will need aerating only once every three years or so. 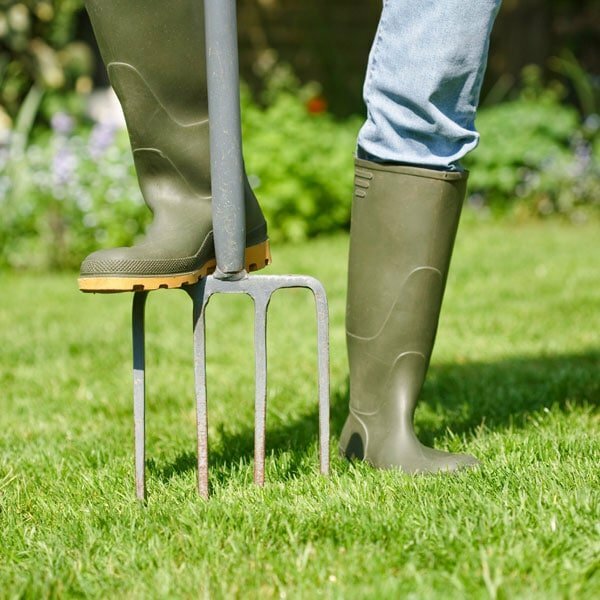 However, if your lawn gets heavy use or if it’s growing in heavy, clayey, or easily compacted soil, then twice-yearly (spring and fall) or yearly (preferably fall) aeration will give your grass a real boost, reducing its need for other, more expensive aids in the form of fertilizers and amendments. It is also quite possible that only high-traffic areas (the path to the garage or the area around the barbeque) will need to be aerated every year, while the rest of the lawn can be on the every third year regime. You can aerate by hand (more work, less money), you can rent a motorized aerator from a garden center (less work, more money), or you can hire someone else to do the job (no work, most money). Clippings often get blamed for thatch, and people rake clippings because they don’t want to contribute to thatch build-up, but this is a false problem with a non-solution. Clippings only contribute to thatch if they are excessively long, or if the thatch layer is so deep that it keeps clippings from decomposing. Thatch only becomes a significant problem when the layer is over a half-inch thick, at which point it can keep water from reaching grass roots, so the roots start growing in the thatch, rather than the soil. Thatch can’t provide the nutrients soil contains, and the increasingly shallow roots are increasingly vulnerable to drought. Thick thatch also becomes a breeding ground for insect pests and for various fungi. If you scroll through any page on fighting lawn insects or diseases, again and again you will see advice to remove excess thatch. For everyday thatch of less than half an inch in depth, use a rake or a tool designed for removing the matted material. Top-dressing (adding a thin layer of soil or compost) can also be helpful, as the soil dressing contains micro-organisms which will help the thatch to decay. For regular seasonal maintenance, these are all that should be necessary, and on many lawns they may only be necessary once a year or even less. Just check the thatch level each spring and fall. For more serious thatch build-up, you may need to rent a vertical mower, a specialized machine that works vertically to break up and remove buildup. Unfortunately, a vertical mower can be so hard on the rest of your lawn that you’ll often need to reseed after using one. Anything that hard on the lawn should only be used in spring or fall, when grass recovers more quickly than it can in the heat and stress of summer. Spring and fall are also the best times for overseeding, of course. An alternative approach is to remove as much thatch as you can manually, then aerate like crazy and top-dress generously with compost. Aerating breaks up some of the thatch, while compost adds micro-organisms that help decompose what’s left. If you do this in spring and fall, you may well be able to bring even a thick layer of thatch under control without resorting to a vertical mower. Soil amendments are conditioners that improve soil texture and structure and adjust its pH, rather than its nutritional content. That’s the domain of fertilizer. Too many lawn regimes fertilize heavily without adding amendments, which means that plant roots cannot make the best use of the food they’re given. Amendments improve the porous structure of soil, insuring the best circulation of air and water, so that plants can actually absorb the nutrients that are there. It’s a good idea to add soil amendments like compost, peat moss, or coir (coconut fiber) at least once a year, to make sure that the soil itself stays healthy. Sulfur (to lower pH) or lime (to raise it) should only be applied after a soil test, since adding the wrong one will damage your grass and the soil beneath it. Here’s a quick and dirty overview of amendments. Compost: If you’re not sure what your problem is, add organic compost. For that matter, even if you are sure, add compost. Compost is the miracle amendment, for it improves all soils. It helps balance pH, making acidic soils more alkaline and alkaline ones more acidic. It improves soil retention in sandy soils and drainage in clay soils. Used regularly, it helps reduce compaction, thus improving soil structure. Amending Sandy Soils: Organic additions work better than mineral or synthetic amendments to improve drainage and relieve compaction in sandy soils, because organic matter derived from plants and animals holds many times its own weight in water. Compost adds much more than organic matter, being rich in nutrients and micro-organisms, but for sheer unadulterated water retention, peat and sphagnum moss or coconut fiber are the way to go. Mature, composted manures are also excellent. Amending Clay Soils: Everything said about sandy soils goes for heavy clay soils as well: compost and other organic amendments are far and away the best. They will make clays more porous, which in turn makes them more workable and improves drainage. Sand and gypsum are frequently suggested for clay soils, but many experts question their effectiveness, and they need to be used carefully. (For more on these debates, see sand as a soil amendment and The special case of gypsum.) With products derived from plants and animals, you cannot go wrong. This high quality calcium carbonate neutralizes soil acids very efficiently. 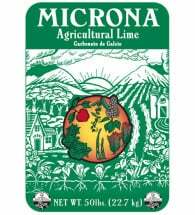 Raising pH (make acidic soils more alkaline): Add wood ashes or Microna® Agricultural Lime, which can be purchased in any of several forms. For lime to be effective, it must be spread evenly, it must be dampened, and it must be in direct contact with the soil. To meet these conditions, rake, dethatch, or aerate before spreading, and water immediately afterwards. Because it is not easily soluble, lime will not wash out of your soil, so liming is usually necessary only once every three years. Over-application can injure grass, usually not in the first year, but in the two years afterwards. BE CAREFUL while handling burnt or hydrated lime, as they are extremely caustic and can burn both you and your plants. Hydrated (slaked) lime can react violently with water or with acids. Lime also comes as pellets, granules, or a powder, all of which are less risky than the hydrated form. 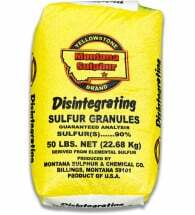 Lowering pH (make alkaline soils more acidic): Add sulfur pellets which, like lime, comes in several forms. For ground rock sulfur, add 1.2 ounces per square yard to sandy soils, and 3.6 ounces per square yard for any other soil. 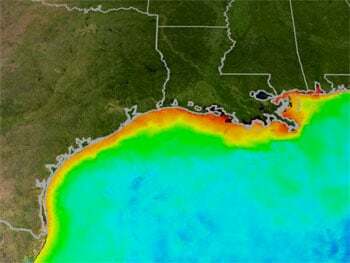 A number of organic (plant-derived) products will also lower pH, among them organic peat moss, cottonseed meal, and even animal manures, but none of these works as effectively as sulfur. 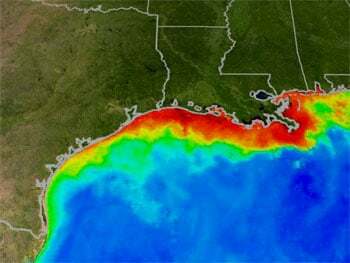 Thus, while many lawn companies offer treatment four times a year, and many lawn-care books and websites recommend twice-yearly fertilizing, some of the most recent research from some of the best agricultural universities is now suggesting that even this is too much. The University of Cornell, for instance, recommends a single fall treatment for a healthy lawn. According to this site, fertilizing in spring merely adds to top-growth, which means you have to mow more often. It doesn’t actually make the grass healthier; in fact the opposite, because it feeds only the grass-blades, not the roots. As a result, the grass outgrows its roots, so to speak, so that the roots will be less able to keep the grass supplied with water and nutrients throughout the rest of the summer. One caveat: the Cornell site is primarily about synthetic fertilizers, the simplified, quick-release kind. Slow-release organic fertilizers will not give as much of a green rush, so they are less likely to cause these problems. If children and pets are playing outside, you deserve to have lush grass and a chemical-free yard. 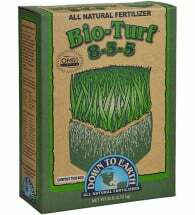 Down To Earth® Bio-Turf Lawn Fertilizer is easy to apply for long-lasting fertilization. Broadcast 5-10 lbs per 1,000 square feet every 2-3 months. 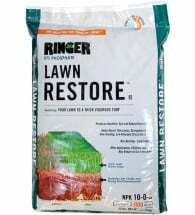 If you fertilize in late summer or early fall instead, the grass will store much of this nutrition in its roots, which means that it will come back thicker, greener, and healthier in the spring, and it will be able to withstand pests, diseases, weeds, and drought far better than if you boost its growth artificially in the spring. All of that, however, goes for healthy, established lawns. If you’re dealing with a new or damaged lawn, you may indeed want to fertilize in spring as well as fall until the lawn looks the way you want it to. 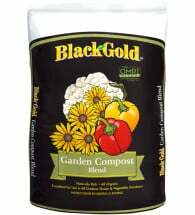 Then, try the once-a-year feeding, and instead of fertilizing in spring, add a top-dressing of compost. All plants require thirteen nutrients from soil, (plus oxygen, hydrogen, and carbon from air), but the three they require in the largest quantity, and therefore the big three nutrients in the fertilizing world, are nitrogen (N), phosphorous (P) and potassium (K). The first of these, nitrogen, promotes the growth of foliage, so it is the key to green grass. The labels on most fertilizers, whether organic or synthetic, will almost always have three numbers that tell what percentage of N, P, and K the fertilizer contains. 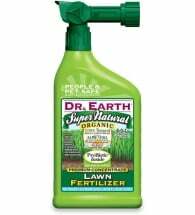 One advantage of organic lawn fertilizers over synthetics is that they usually provide at least trace amounts of nutrients other than the primary one they supply, and a number of them help soil structure as well. Because they are slow rather than quick release, fertilizing is required less often with organics, and the grass doesn’t outgrow its roots, as can happen with synthetics. Warren Schultz and others offer a detailed feeding schedule that differs from one “grass zone” to another in the U.S., but the rule of thumb has long been to fertilize twice a year, in spring and fall (see Responsible Fertilizer Practices for Lawns). In the south, it’s possible to feed lightly each month throughout the summer, since warm-season grasses keep growing through the hot months. Most lawn gurus, however, will warn against fertilizing during the dog days of August. In the north, it’s far better to stick to the spring/fall or fall-only schedule, since cool season grasses are actually semi-dormant in the summer. If you do fertilize then, you’re either pushing your grass against its natural growing pattern, which stresses it, or you’re feeding the weeds. A soil test (which usually costs under fifty dollars) will tell you precisely which nutrients your soil is lacking, but there are other good indicators. For instance, all plants require nitrogen, but clover and black medic are amongst the plants that can get the nitrogen they need from the air. Therefore, even when your grass has exhausted the nitrogen in the soil, these two plants will continue to grow green. So if your lawn looks tired and yellowish except for the bright green patches of clover or black medic, chances are it needs more nitrogen. BE CAREFUL when using any of these fertilizers; the nitrogen that makes them so good for grass can also “burn” it. Don’t over-apply them, and don’t spread them in the heat of the day, as sun augments the burning action. It’s best to apply them in early morning or late afternoon, and water immediately. Grass Clippings: one of the best (and definitely the cheapest) fertilizer you’ll find. Either leave clippings as you cut them, or compost them and return them to the soil later. Learn How to Recycle Grass Clippings here. Corn Gluten Meal: 9% nitrogen, so it feeds your grass and also prevents seeds from sprouting. This is the only organic pre-emergent weed suppressant. Available at any gardening store worthy of the title. 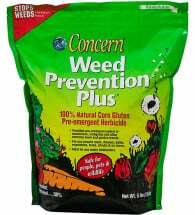 Derived from corn gluten meal, Weed Prevention Plus is an all natural weed and feed for use on lawns. 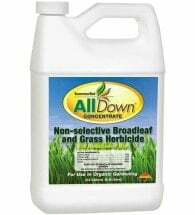 Prevents crabgrass, dandelions and many other common weeds from emerging and is SAFE for people, pets and wildlife. Each 25 lb. bag covers 1500 square feet. Less Emphatic Warning (hence not in all caps): Don’t over-use corn gluten in spring, or your grass will go nuts, and you’ll be out there mowing it every other day. Blood Meal: 12% nitrogen, and available at any organic gardening store, including on-line ones. NOTE: Both corn gluten and blood meal are slow-release fertilizers. This means not that they take forever to start working, but that they keep working for a long time, because they break down and become available to plants more slowly than do synthetic fertilizers. 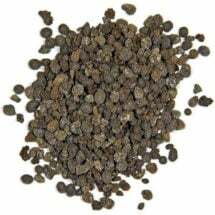 Cottonseed Meal: At 6% nitrogen, it’s an excellent fertilizer. However, if it’s not organic it may contain toxins, as non-organic cotton receives a lot of synthetic treatments which can concentrate in the seeds from which the meal is made. 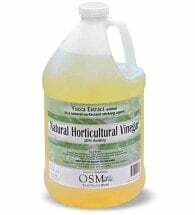 Fish Emulsion: Like many synthetic fertilizers, this can be sprayed, a favorite mode of application. It may stink up your lawn or garden for a few hours, but unlike synthetics, it won’t harm you if you breathe some, and it won’t harm your pets if they lick their paws after walking across the newly-sprayed lawn. NOTE: Unlike the other two products, fish emulsion is a quick-release fertilizer, meaning that it goes to work at once but that its effects wear off within a couple of weeks. This is a good choice if you want to give a lawn a jump-start or tide it over a bad month. If you’re depending on this when rehabilitating a damaged lawn or starting a new one, you may want to fertilize more frequently than suggested above. 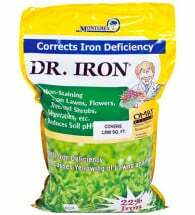 Raises pH in acidic soils and is an excellent source of calcium and magnesium.